The Basics of Becoming a #Plantlady (or man)! Hi plant lovers (or soon to be plant lovers)!! Over the next few months, I will be covering topics of all things PLANT RELATED! Each week, I will also be discussing tips on my Instagram Stories so if you want information asap - follow me on there. Today I am covering the basics for anyone just getting started with plants or they feel like they cannot keep a single plant alive. 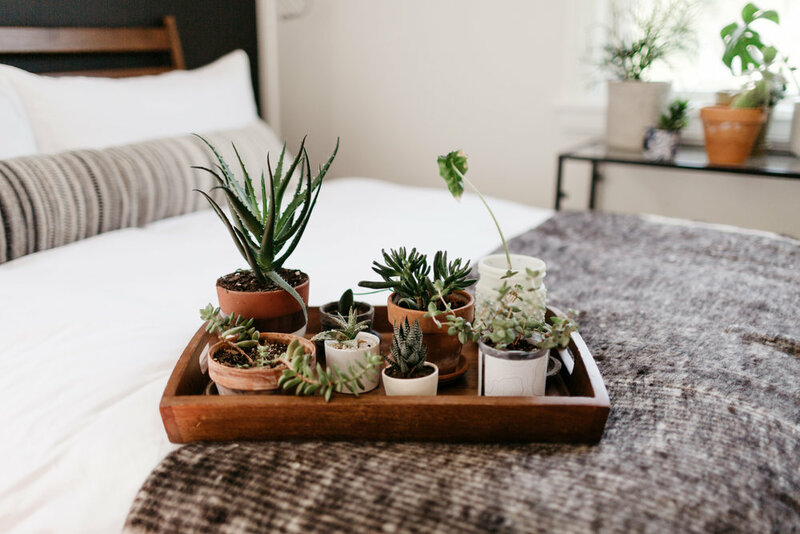 This is going to be your foolproof way of becoming a #plantlady (or man)! First things first, what are the easiest plants to keep alive? I wish I could tell you it was the oh so trendy fiddle leaf that basically is a full time job to keep alive and is the plant that secretly makes all beginners think they have a black thumb and that they should give up on plants. HA! Although it’s not the fiddle leaf - they are beautiful and both can grow to be really large plants if that is what you want. These are both ones that do not need a lot of light and are okay if you forget to water them here and there (even though I will share a tip so you get better at that a little farther down). In my shop on my “featured” list I have included the 2 plants that can survive basically anything. In the shop you can buy them already potted in a pot I would recommend or you can just get them without the pot and use one you already have. Lighting: They just need to be in a room where there is natural light (aka a window). If you stand between the plant and the window there should be a shadow on the plant (this lets us know that natural light will reach the plant). This is what is referred to as “low-light plants” or “indirect sunlight”. Pots: These are more important than you think. While you might want that really pretty basket to put you plant in...until you have mastered the green thumb it is important that you get a pot with a draining hole in the bottom. Hence why I just linked the ones with the pots that are already good to go in my store...and they ARRIVE potted which is helpful when you are just starting out. Once you can keep one plant alive for an entire year, then you can graduate to a basket or a pot without a drainage hole. The other thing that is important is that the material of the pot is good for moisture and the soil - I will go into detail on this later. Watering: This should honestly be a post on it’s own and probably will be but ill keep this explanation to the basics. Some plants may need more than others, but I have done this routine for over 50 plants for 3 years and maybe 3 have died in that time so a horticulturist might tell you I am crazy...but for me this routine works and I never forget to water them. March - April: Water every other week. May - August: Water every week. September - October: Water every other week. November - February: Water once a month. How I water takes effort but I promise it has been the reason my plants are so healthy and thriving. I take them ALL outside, fill up a cooler, and drench them in water. This is why the drain hole is so important. Now they aren’t drowning where an inch of water is at the top and not going down, but it is likely more water than you think. I like to do it with a cooler and bucket rather than a hose because I can control where the water is going and dirt isn’t splashing around everywhere. I leave them outside for 2 hours (maybe 30 minutes in the winter months) to really allow them to drain and then bring them back inside. The trick is to just do it on the same day each week or month so you do not forget. Pro tip: If you keep around 5-10 plants in your house this should be a breeze...when you get over 25 is when it becomes a thing and your plants start to seem like more maintenance than raising a child. Fertilizer: I have linked this in the shop as well. I use two different kinds and both of them are organic. I only fertilize during April - September. They do smell like fish (which is another reason I leave plants outside when I am watering because it helps the smell go away) but I also just light a candle for a bit once I bring them back inside and I no longer notice the smell. There are instructions on each of these bottles - I probably use a lot more than it calls for, so I don’t think you have to be too precise with it. This is also why I like using a cooler to water -- this fertilizer is liquid so you add it to the water before watering the plants. Soil: I have used all different kinds of potting soil. I have linked my favorite in the shop. Soil isn’t something I have researched or tested much -- so for now I will just say get the kind in my shop and maybe in a later post I can share more after I test some different things over a few months. If you want to become a #plantlady or just want to prove to yourself that you have the potential to have a green thumb, everything above is what I highly recommend and I have linked it all in the shop to make it easy for you to know exactly what to get. Also, in the store I have a “plants and outdoors” section with these products in it plus a few more for those that are past the beginner #plantlady stage. Please feel free to DM me on Instagram if you have any questions at all!